Dermatologists are the doctors who deal with all things skin-related, whether it’s acne, weird moles, or skin cancer. As with any profession, it’s important to know what you’re getting yourself into before you decide to go for it. If you’re willing to put the work in, dermatology can be an extremely rewarding (but also demanding) career. You have to be very intelligent to be a dermatologist, not to mention dedicated and determined. It takes years of schooling to get such a specialized degree - you should plan on at least eight - and that’s after you get a bachelor’s degree. And medical school isn’t cheap. That’s a lot of debt to wrack up, especially if you plan to open your own clinic, which is going to require even more loans. If not, you’ll probably have to work under someone else for a while, and if you are going into the field for the freedom it offers you, this may rankle a bit. Luckily, since you’re spending hundreds of thousands of dollars on school, you can look forward to a pretty good salary. The median dermatologist salary is about $300,000 a year, which is nothing to turn up your nose at. Dermatology also has good projected job growth, meaning more and more people are seeking out dermatologists. You’ll generally have the opportunity to make your own hours (even if you’re working out of someone else’s clinic), but bear in mind that those hours can be very demanding, both physically and mentally. 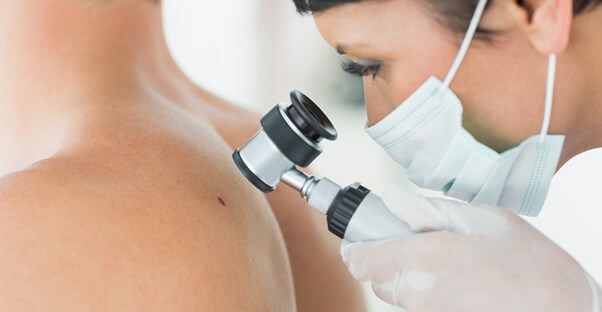 A lot of people think dermatology is not necessarily an “easy way out” for being a doctor, but a way to be a physician and not have to deal with quite so much blood, gore, surgery, and death. Not so. While you don’t have to be a surgical dermatologist, you certainly can be. But the chances are still pretty good that at some point, you’re going to have to tell someone that the funny spot on their nose is cancer and could kill them. That’s not an easy thing to do, no matter what profession you’re in. If you like working with people, this is certainly a great way to do it. The vast majority of cases aren’t life-threatening, and if you’re friendly and have a good bedside manner, your patients will love you for it. It will make breaking bad news easier if you’ve developed a good rapport. Not only that, but you get to use those brains. Some cases, yes, will be very simple to diagnose, and sometimes all you have to do is prescribe the right acne medication for an overwrought teenage girl with a pustule-ridden face. But sometimes you’ll really have to know your stuff, which is where being a brainiac, not just a nice person, comes in handy. It can be exciting to make note of all the signs and symptoms and use your knowledge-base combined with a little research to be the person who can finally let your patient know exactly what is wrong with them. Dermatologists vs. Estheticians: What's the Difference?